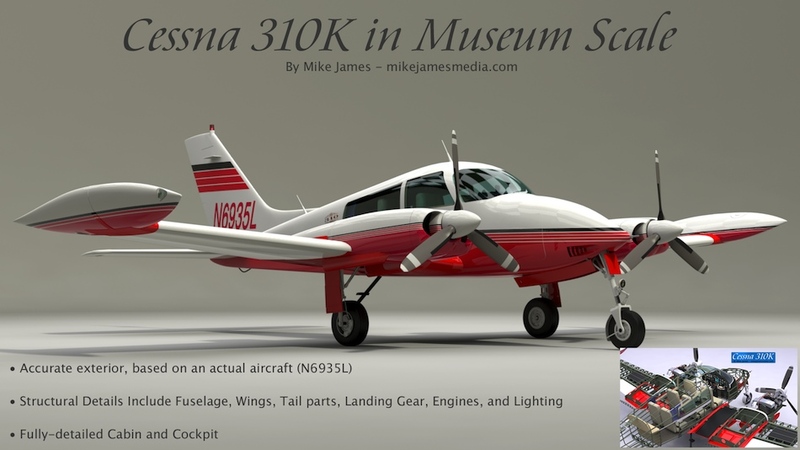 Cessna 310K in "Museum Scale"
This aircraft is not only a scale exterior model, but, like my Cessna T-50 project, it features a detailed interior structure, cabin and cockpit details, interior and exterior lighting, and rigging of the control surfaces. At this time, this model has about 11 milion polygons, and the file size, (in native .lxo format) including all the images used for textures, is about 60 MB. In MODO, animation of everything below is controlled by a "HUD-style" panel with slider controls. These will not transfer properly to all other file formats. However, the centers ("pivot points") should transfer properly, allowing you to rig the model in other applications. 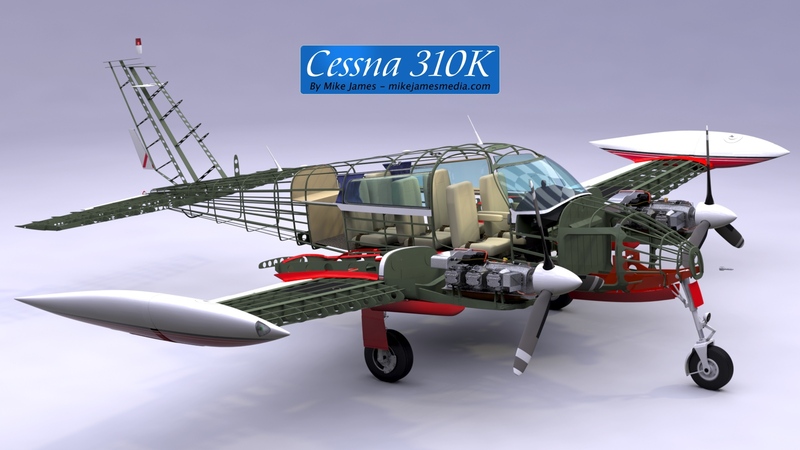 Much of the interior structure is included, and was modeled from original Cessna drawings. 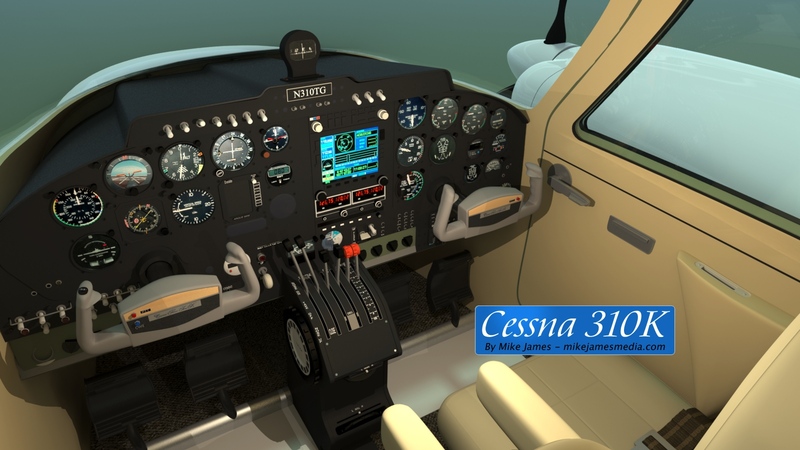 Instrument panel was specifically modeled after N6935L from photos shot by the owner. Lots of small detail - Seats have seat belts and mounting rails, fabric in the cabin has wrinkles, there are personal items in the cabin and the wing lockers, and even a magazine in one the seat pouches. Engines, engine mounts, and accessories are modeled to a moderately-detailed level. Interior fuel tanks are installed in the wings, as well as the wing tips. Landing gear is detailed and functional. Details like control surface trim tabs (animatable) the pitot tube, and external antennas are included. The two front nose "hatches" are removable, and provide access to the avionics bay, should you want to add those parts. The lighting system described below is set up so that when any light is off, there is a photorealistic depiction of the light bowl, bulb, and reflector. When any light is turned on, luminous polygons are also turned on, to visually show the "emitter" (light coming from the bulb) and separate (invisible to the render) spot lights are used to cast light onto surfaces like the runway. This means that the renders will look good in either day or night shots, with the lights on or off. Landing gear is steerable on the ground, and retracts, along with sequencing gear doors. The nose gear also includes a taxi light, which can be turned on and off. Landing lights in the wings retracts, extend, and turn on and off. Wingtip position lights and rotating beacon on the vertical fin can be turned off and on. The beacon flashes as on the actual aircraft. Interior lights can be switched on and off, and dimmed. 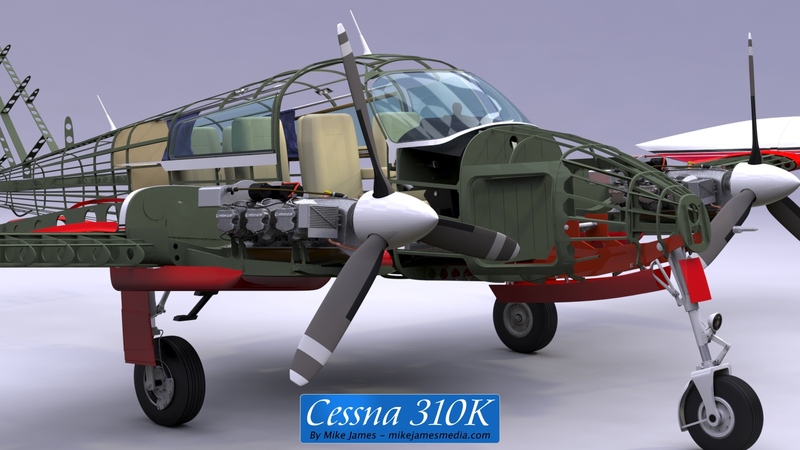 Wheels rotate when the aircraft moves, and the propellers are animated. Cabin door, baggage door, and wing locker doors can all be opened and closed, via one "stepped" slider. 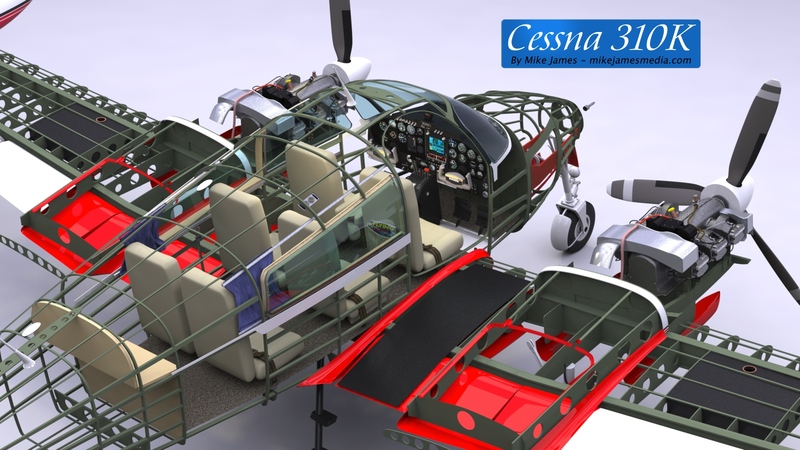 The visibility of the airframe's parts are controlled by a slider, making it easy to render the plane's interior structure, then include the interior liner, and finally, show all parts, plus the outer skin visible. Nearly every part in the cockpit can be animated, down to individual toggle switches.